The project building is a 15-story development with a striking façade design. 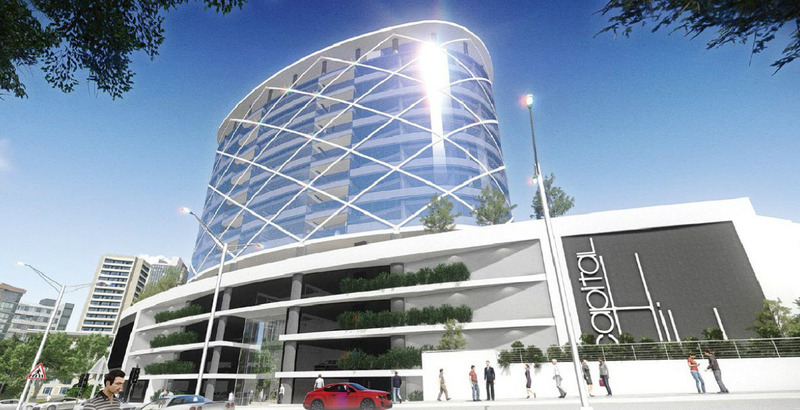 The development has 7 Commercial Office floors, 7 Parking levels and a Roof Terrace area. The building has achieved a 4-star Green Star SA Office v1 Design rating. The main façade faces NW and features full curtain wall double-glazing with 3⁄4 vision glazing on all but the SE side. The top 1⁄4 of the glazing has a 50% frit to minimize solar heat gain. The Structure of the building is reinforced concrete and this thermal mass is used to help moderate the internal temperatures by exposing the slab around the building perimeter at ceiling level. The HVAC system was designed in conjunction with the other building systems and design elements to be as efficient as possible. The building uses occupancy sensors and area zoning for the lighting controls. Energy and water usage is metered separately for each tenant and is monitored by a BMS. The Project is located in a dense urban area close to amenities and public transport. Fuel-efficient vehicles have preferential parking in the building.